Wexford Plantation is a truly exclusive, luxury residential community located on the south end of Hilton Head Island. Winding through the center of Wexford is its unique Harbour and lock system that provides access to Broad Creek. 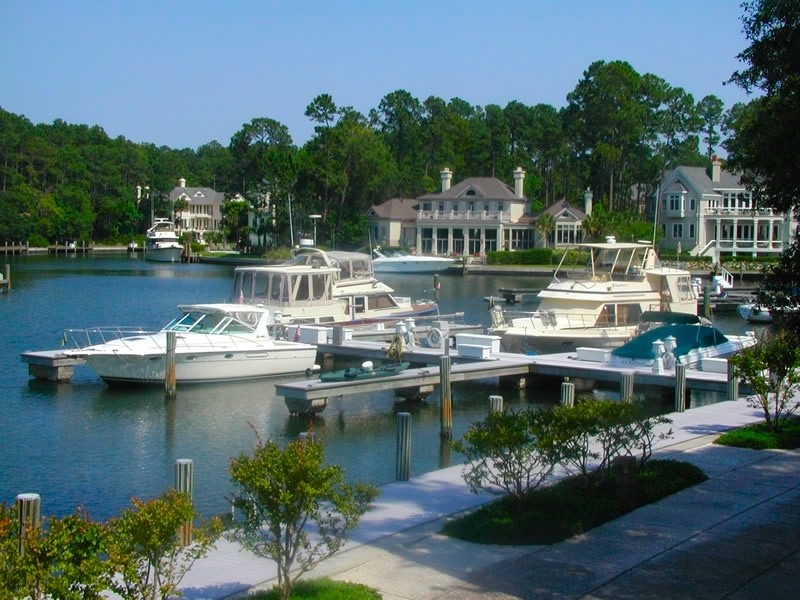 Boat slips are available at the marina, although many homes enjoy their own deep water access. Both the home prices and POA fees of Wexford Plantation real estate are on the upper end of the area price range. The homes of Wexford are built in the British Colonial style, with magnificent entrance ways and soft, pastel colors. While each of the homes stays true to the Caribbean theme, each is its own unique masterpiece. Wexford is comprised of single-family homes with a limited number of townhouses. Home sizes begin at about 2,200 square feet. At the heart of the community is the multi-million dollar clubhouse, a British Colonial style facility located on the Harbour. Membership comes with property ownership and includes complimentary access to golf, tennis, Harbour and pool. Dining is available six days a week for lunch, including Sunday brunch. Dinner is served three nights a week and fine dining on Saturday nights. The clubhouse hosts special events 2-3 times each month including dinner dances, cookouts, events for children, wine-tastings and newcomer parties. Winding through the center of Wexford is a 37.5 acre Harbour with access to Broad Creek and the Intercoastal Waterway. An innovative lock system controls the water level in the Harbour to a minimum of eight feet. Boat slips can accommodate yachts up to 75 feet with 19 feet in beam. Property owners may moor boats at the marina or at their private docks on their property. Boat slips at the marina are equity memberships and have some fees and may only property owners may own them. There is a full time Harbormaster at Wexford and two assistants. Tennis – Six Har-Tru tennis courts. Two are lighted courts for night play and for intra and inter club play. Membership with ownership. This elegant golf course, designed by Willard Byrd and redone in 1999 by Ken Venturi, couples scenic beauty with shrewd design that challenges anyone. A Head Pro and 3 assistants are on staff. Wexford is a private community centered on a beautiful harbor with a lock system that adjusts to the tidal changes that is appealing to many boaters. It is also an upscale golf community where membership is included. Many of the homes have private docks and are quite spacious. All of the Hilton Head activities including beaches, restaurants, and shopping are nearby. Country club lifestyle and upscale homes are descriptive of this primary residence and second home type community.